The DEWALT DW745 is one of the best tablesaws on the market. Continue reading for a review, or click the button below to get the best price on the web for the Dewalt DW745 10″ Portable Job Site Tablesaw! Click Here to View the Best Price! If you want to do something right, it doesn’t really matter what it is. You’ll need quality tools to help you see it through. And when it comes to woodworking, owning a table saw is considered a must. If you don’t already have one or if you’d like to get a better one, you might want to consider DeWalt. This company is known for top-quality power and hand tools for all the major industries, including construction and manufacturing. Let’s check out the pros and cons of the DW745 model! 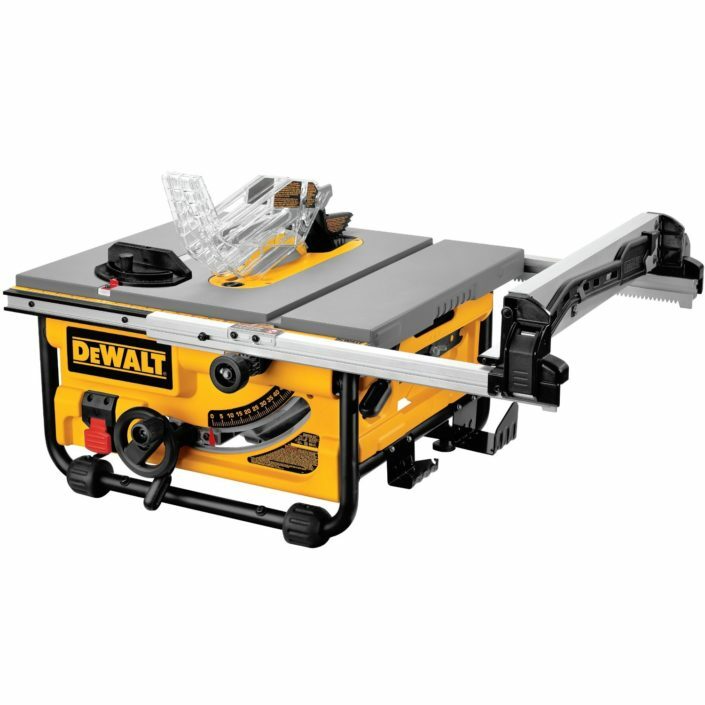 What are the benefits to using DeWalt DW745 table saw? When it comes to weight, you can’t beat the DW745 model, at least if you’re staying in its price range. This table saw weighs only 45 pounds, which makes it one of the lightest available. Thanks to this, it can be easily transported from place to place. That’s why it’s one of the most highly rated pieces of gear among professional construction workers. Also, its design makes it a compact tool. Since it’s only 13.9 inches high and under 30 inches long, it doesn’t really take up much space. And it features on-board storage you can use to keep all the guarding components. For them to be any good, table saws need to be able to provide a lot power. This is why it’s important for them to be equipped with the best motors. The DW745 boasts a 15-ampere unit. Thanks to this, it’s capable of spinning the blade at speeds of up to 3,850 rpm. This is why this particular table saw is suitable for working on a wide range of tasks. They include cutting hardwood and other tougher jobs such as handling pressure-treated lumber. The blade of the DW745 model is designed to provide you with both accuracy and speed. It’s a 10-inch blade made of sturdy carbide. While the material makes it incredibly tough, the design allows it to make all sorts of cuts. When you’re using it at 90 degrees, it can go as deep as 3.125 inches. And when it’s set to 45 degrees, its maximum depth is 2.25 inches. As we’ve already mentioned, it’s capable of spinning at very high speeds, its maximum being 3,850 rpm. One of the best things about DeWalt DW745 table saw is its rip capacity. This can all be thanked to its innovative fence configuration. It boasts an improved telescoping design that makes the rails a lot more flexible. They can be pulled out to the length of 20 inches. As a result, they’re capable of ripping full sheets. And since they can be pulled back in, they contribute to the compact design of the product itself. To make it even better, fence adjustments are both fast and smooth. This is mostly due to the precision of the rack and pinion rails. Another big advantage to using the DW745 model is its ease of use. The product is made to keep the process as simple as possible without affecting its performance. Its on-board storage is meant for keeping guarding components. These can be adjusted without using tools. And if you’re worried about maintenance, we’ve got good news. This table saw is equipped with a port for dust collection. With it, you’ll have no problem keeping your work space clean. And last but not least, with the DW745 model comes all the necessary equipment. Apart from the saw and the blade, you’ll also get a miter gauge, a blade guard and a push stick. They can all be used to guide the material, hold it at the right angle and protect the hands from the blade. The price is right for such a high quality power tool. You can view the lowest price online by using our button just below! 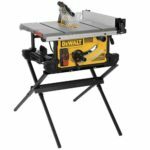 What are the downsides to using DeWalt DW745 table saw? When talking about the cons of using a product, it’s best to look for reviews. What we’ve managed to dig up is that this particular saw has one major downside. According to a number of people who’ve used it, it’s likely that you’ll encounter some blade issues. It seems that, after a while, the blade stops rotating smoothly and starts doing sudden drops. All things considered, DeWalt DW745 table saw is an excellent product for amateurs and pros alike. It provides a high level of accuracy, speed and functionality. Since it’s both durable and affordable at that, it’s no wonder people are giving it such good ratings!